Brent Danem Mayne was born on April 19, 1968 in Loma Linda, California. The tall six foot catcher was the Kansas City Royals first round draft pick (13th pick overall) out of California State University. The next season he was brought up to the Royals big league squad for nine games. 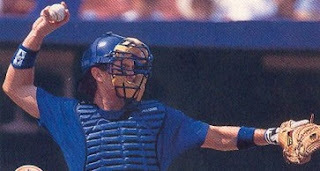 Mayne spent six seasons in Kansas City sharing time behind the plate with Mike Macfarlane. He came in 8th in the 1991 Rookie of the Year voting & threw out 40% of would be base stealers the next season. 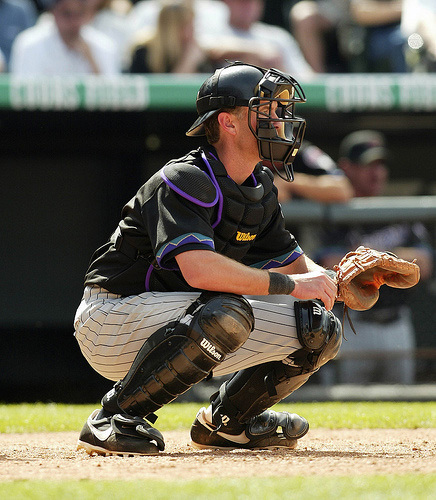 In 1995 he was the main catcher seeing action in 110 games (103 behind the plate) batting .251. In the winter of 1996 he was traded to the New York Nets for minor leaguer Al Shirley. In 1996 he was Todd Hundley’s back up catcher, although he only saw action in 21 games behind the plate due to Hundley’s durability that season. Mayne would only throw out one of the 23 base runners attempting to steal while he was behind the plate. By the end of May he was hitting at .290 & then in August he brought his average back up again near the .300 mark. In 70 games on the season he batted .263, hitting a HR on April 25th in St. Louis. After the season he was granted free agency & signed on with Oakland. He would spend time there as well as San Francisco, Colorado, back to Kansas City , Arizona & Los Angeles as a backup catcher through the 2004 season. In 2000 he was brought in to pitch an inning by his Rockies manager Buddy Bell. He pitched a scoreless inning & became the first position player since Rocky Colavito in 1968 to earn a victory when the Rockies won it the next inning. He is the only catcher in the entire 20th century to get credited with a win. In his two seasons back with the Royals, he was their main catcher, enjoying a good 2003 season where the team finished third after being in the wild card run all season. Mayne finished his 15 year career with 951 hits 38 HRs 178 doubles & 403 RBIs playing in 1279 games. In his career he posted a .993 fielding %, ranked at #18 all time. 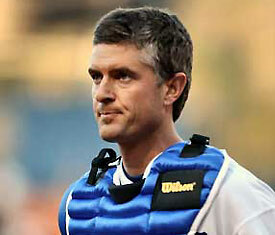 His 1143 games behind the plate are 80th all time, & his 6186 put outs are 58th all time. There have been 651 successful stolen bases on Mayne, 95th most on the all time list.